The attic is the portion of the homes or rooms that are nestled in between the roof and the upper ﬂoors or ceiling board. It most cases this area is not utilized for living space. Some people elect you use it for storage purposes. Given its close proximity to the roofs of the house, it is ordinarily more vulnerable to the risks of overheating in the day, excessive cold at night, and extreme temperature ﬂuctuations. This is why it, of necessity, has to be appropriately insulated. We are going to examine the main reasons why it is necessary to insulate this portion of the home. We shall close it all by looking into the different types of attic insulation techniques thereafter. The main reason to insulate your attic is to stabilize the internal temperatures. This simply means keeping the internal temperatures more or less constant throughout the day and night. During the day and the summer months, the internal temperatures are often too high. This is occasioned by the similarly high temperatures external temperatures. At such times, the insulation blocks excess heat from seeping into the rooms. In winter months and at night, the external temperatures are often too cold. At such times, the insulation traps the interior heat from escaping outside. It also blocks excess cold from seeping into the room. This way, the temperature of the attic remains fairly constant throughout. Condensation is the process by which water droplets settle on surfaces. This usually occurs as the result of humid air coming into contact with extremely cold surfaces. This phenomenon is highly unwelcome especially if the said surfaces are made of wood. By stabilizing the internal temperatures as stated above, insulating your attic thus contributes to the prevention of condensation. This is especially great if you use the room for staying or as a bedroom. 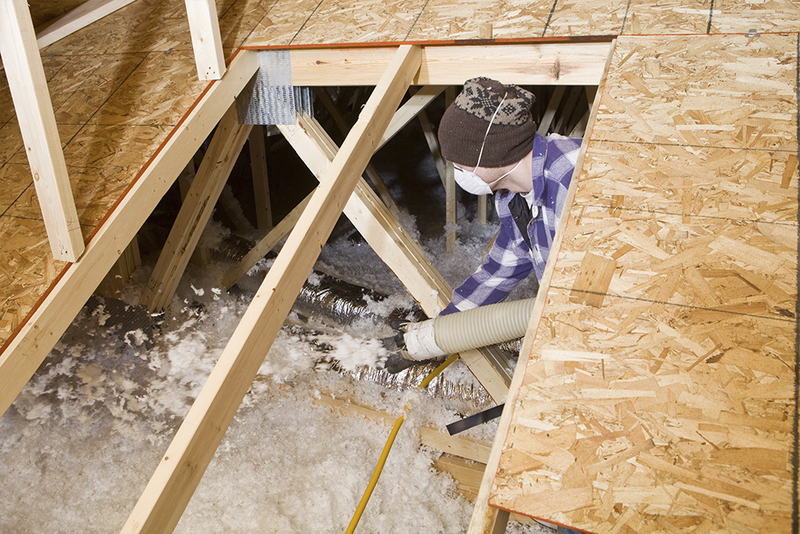 Insulation increases the ﬁre safety of the attic in two main ways. 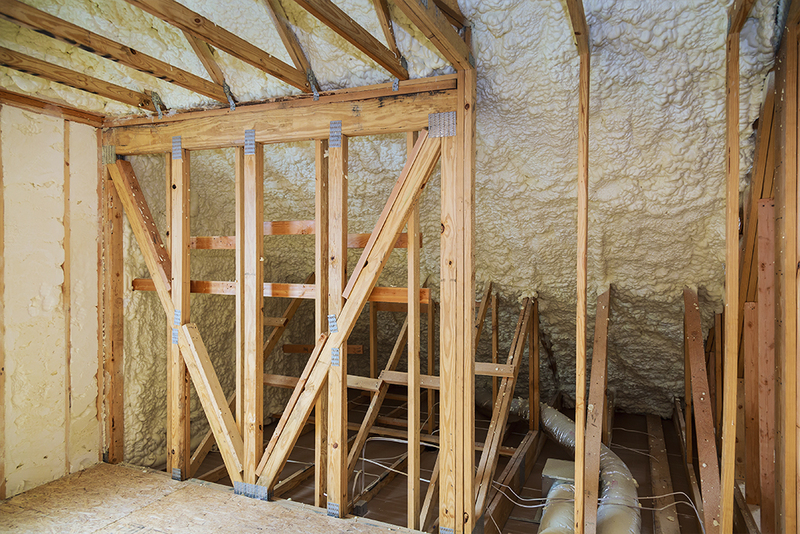 For one, most materials that are used to insulate the attic are themselves ﬁre-retardent. In the event of a fire, they contribute to the mitigation of the spread and severity of the ﬁre. In light of this, they reduce the associated damages considerably. Secondly, insulation in and of itself reduces the risks that are associated with ﬁre outbreaks regardless of the materials used. This is because it slows down the possible increase in temperatures of the construction materials. This way, it makes evacuation safer and worthwhile. By insulating your attic, you also get to enjoy the added beneﬁt of a quiet room. This is because the materials utilized for the job blocks external sounds from seeping into a room. This way, they keep the internal ambiance quiet and ideal for peace and quiet. Lastly, insulation conserves energy. As explained earlier, this technique keeps the internal temperatures of the attic area relatively constant throughout the day and year. In the summer months, it reduces the electrical energy needed to keep the interiors of rooms cool. In the winter, it also reduces the heating energy by reason of trapping a sizable chunk of heat energy. This translates to relatively less utility bill on your part. Fiberglass is a kind of material that is made of plastic which is reinforced using glass ﬁber. It is then cut down to some predetermined shapes and sizes. The end result is what is often called loose fill insulation. These fibers are the ones that are used to insulate the attic. In most cases your attic can be “blown” in the matter of a few hours. 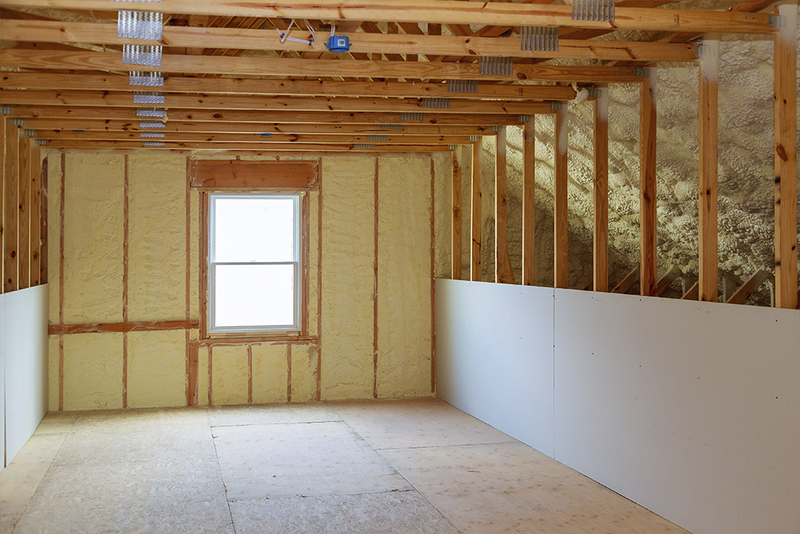 Spray foam insulation is often used in the attic areas of your home. Using this method, spray foam insulation is sprayed to the underside of the roof line, encapsulating the attic area. This method of insulating your attic is far superior to other methods. By adding spray foam in an encapsulated attic, your utilities are often 40-50% lower. Your home is more comfortable because it elimantes hot and cold areas of the house. This results in more even temperatures in the home. Also by insulating with spray foam insulation in the attic, your HVAC equipment last longer and doesn’t require as much maintenance. to their roles in housing several electrical systems, plumbing pipes, and having walls determined by the shape of your roof. As such, insulating an attic is often exceptionally difficult when compared to the flat and large surfaces of the walls. For this task, Affordable Insulation offers blown-in fiberglass insulation, an affordable and versatile product that is adept at filling in the odd spaces that often characterize attics. This will provide a more effective insulation solution than standard fiberglass batts, which have to be cut by hand and are ineffective at insulating small spaces. higher than they should, as your ventilation and heating units have to work overtime to compensate for all of the wasted heat. We can provide an efficient and versatile solution with our blown-in fiberglass insulation. In addition to being affordable, fiberglass retains heat extremely well and does not allow temperature to escape. The blow-in method also ensures that it will fit to any of the awkward spaces in your attic. Furthermore, fiberglass is resistant to moisture, which comes in handy during the rainy season. Your roof will be battered by many rainstorms over the year, so your first line of defense should be insulated by something that is rather immune to water damage from these rains. As a bonus, we install to an R-value of 30, which is higher than the Department of Energy’s recommendation for attic insulation. When you go with Affordable Insulation, you can be sure that you’ll be able to get tailored attic insulation at a reasonable price.